A lefty playing on a right handed drum set ! Handycapped ? I AM A LEFT HANDED SELF TAUGHT DRUMMER. I UNFORTUNATELY HAVE NEVER BEEN SCHOOLED IN THE ART OF DRUMMING AT ALL. I'M 48 YEARS OLD AND HAVE A DESIRE TO FINALLY AFTER 38 YEARS TO BETTER MY PLAYING SKILLS TO AS HIGH OF A LEVEL AS POSSIBLE. 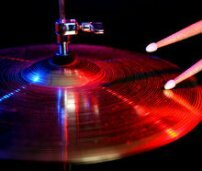 IVE WATCHED RIGHT HANDED DRUMMERS ALL MY LIFE WITH SOME ENVY IN HEART AS TO THE THE DIFFERENCES IN THEIR ABILITIES OF PLAY COMPARED TO MINE. I FEEL AS THOUGH PLAYING THE WAY I DO (HANDS UNCROSSED,RIDE CYMBAL ON THE LEFT, ETC.) AND TOO MANY MORE DIFFERENCES TO MENTION LIMIT MY ABILITIES TECHNICALLY. DO YOU FEEL THIS COULD BE TRUE AND CAN YOU MAKE ANY SUGGESTIONS TO ME ON HOW TO MAXIMIZE MY SKILLS? IVE PLAYED IN MANY BANDS OVER THE YEARS AND HAVE MANAGED TO GET BY BUT THAT'S JUST IT. I DON'T WANNA BE JUST A GET BY DRUMMER, I WANNA BE A GREAT DRUMMER. I KNOW I NEED TO TAKE SOME TECHNICAL LESSONS TO LEARN RUDIMENTS ETC? SHOULD I TRY TO MAKE ANY MAJOR CHANGES IN MY SET UP?, OR WHAT? I WOULD APPRECIATE ANY ADVISE YOU COULD THROW MY WAY. THANK YOU FOR YOUR TIME. As far as your set up, try changing to a left-handed set up: HH on right with cross hands position, Toms mounted from right to left with FT on left. If you Play double bass, you can get left hand configurations or it may be possible to alter an existing RH pedal. Although this set up will likely make it more comfortable for you to play, it will not make a huge difference in your technical skills. You can even custom order drum sheet music for any songs not already on the site. Good luck with your playing. You will find that as you improve, you will become even more motivated!